These days, there are several different pool test kits on the market that will test pool chlorine levels. In this article, I’ll show you how to use the two most popular types of test kits to test pool chlorine levels – Pool Test Strips and Pool Liquid Drop Test Kits. It’s important to note that there are different kinds of Chlorine present in your swimming pool water; Free Chlorine, Combined Chlorine and Total Chlorine. Free Chlorine – is the chlorine that is available to sanitise your pool water. It does the hard work of killing bacteria and any nasties in the water. Combined Chlorine–as the chlorine works in your pool water, it gets converted to combined Chlorine. Total Chlorine – this is the Free Chlorine and Combined Chlorine added together. Make sure the test kit you have will test for free chlorine and combined chlorine. 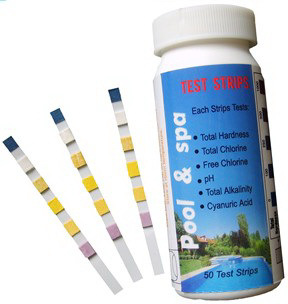 Using test strips is by far the easiest way for pool owners to test the chlorine levels in their pools. They’re becoming more accurate and these days, some pool industry professionals use this over liquid test kits. Take a strip. Hold it in the pool water for five to ten seconds. Wait about fifteen seconds. The chemical pads on the end of the test strip will change colours in this time. On the test kit package or instructions, locate the test for the chlorine you’re testing for. Compare the test strip colour against the chart that came with the kit to determine the level of chlorine in the water. If required, add chemicals to the pool water to adjust the levels. See instructions below. This method takes a little longer and is an older way of testing your pool water for chlorine. It’s still reliable and a lot of pool industry professionals still use this method over test strips. Get a pool water sample by using the container provided with the kit. Put the container into the water upside down to elbow depth. Bring the container out of the water and level off the water as directed. Add the correct amount of liquid drops to the water sample. Follow the instructions of the kit to do this correctly. Each kit is different. The water sample colour will change quickly. Compare the sample colour to the colours on the chart that was included with the chlorine test kit. The ideal reading for Free Chlorine is between 1 and 3ppm. If the Free Chlorine level is too low – add more chlorine. If the Free Chlorine level is too high – leave your pool uncovered for several hours. The sunlight will reduce the chlorine levels fairly quickly. If the chlorine level is way too high, consider adding a neutraliser to the water. You can buy this at your local pool shop. Where can I buy your chlorine test kits? I live in Canberra.